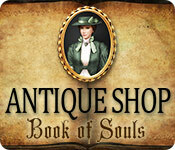 Antique Shop: Book of Souls is rated 1.9 out of 5 by 55. Rated 5 out of 5 by SandraWright1949 from Anitque Shop: Book of Souls I enjoy playing this game that I bought. There is nothing wrong with this game. Just make sure the Cursor and the Fullscreen are checked and the curser movement tab is moved all the way to the left and this should solve all your problems. I did not have to use the lantern or the maginafing glass at all. Rated 5 out of 5 by FORTUNATUS from Unfortunate so many low stars for such a GREAT GAME.... This is a H0G with a very heavy adventure game flow to it (love that!). On my widescreen monitor, WOW!.... the graphics are HD and simply outstanding.... don't know why so many are complaining about that but perhaps you can change your resolution. Again, on my monitor the graphics are WAY above the norm! Anyhoo, I love the storyline; it's engrossing and above average in the way it's presented. I enjoyed reading the journal, and normally that is something I consider a chore.... again, it is done with a flourish and prose that is not common in games lately. The H0G scenes are so intricate and well thought out. I enjoyed the items being referred to as, for example, 'Siberian Thrush,' instead of "bird" [I believe this game is Russian based]. So, bottom line, despite all the bad reviews, IMHO this is truly a VERY good game and the storyline is detailed and believable [for a paranormal storyline that is]... I, [for one, lol!] am LOVING this very atmospheric and clever game. A definite buy... thank you developers and BFG! : ) BTW> For those complaining in the main reviews, to activate the lantern and magnifying glass all you have to do is click and then right click w/mouse, as per the instructions. Rated 4 out of 5 by ninja226 from For die hard hidden object lovers This game is for people who like finding treasure (needle) from a haystack. The bad reviews are not deserved. The challenge is to find HIDDEN objects, so yes, items are small and well hidden. The magnifier doesn't work that well, but I liked the challenge of finding hidden objects. The graphics are excellent, but static. No special effects or video cut scenes. There is a lot of reading, and the character names are unpronounceacle. That part is boring. In between HOPs are puzzles like jigsaw puzzles, search for words, match 2 objects hidden under cards/objects, etc. It's a very simple, basic game. You have to enjoy finding small, well hidden objects and reading a boring novella. 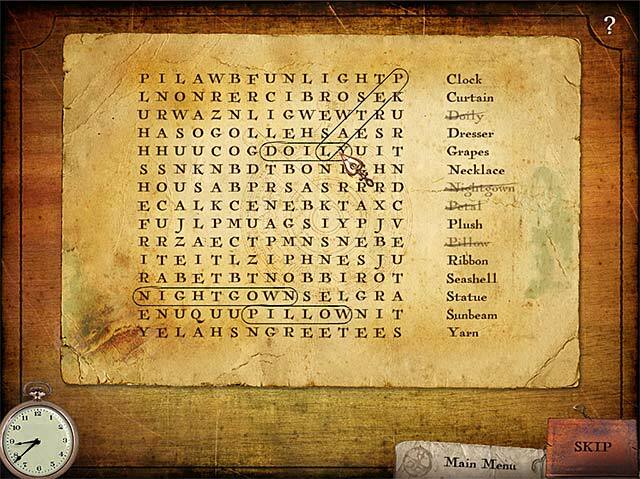 Rated 4 out of 5 by Copperfield from If you like Victoriana You will love this game. Very "Victoriana" in feeling; lovely graphics. I am a HOG lover and thought this was a fun game. Perhaps the other hints about setting your resolution may help. I had no problem and would play this game over and over. That, to me, is worth the money. Rated 4 out of 5 by Sarcofagus from Don't judge what others think, decide for yourself. I had read the reviews, both negative and positive. I didn't use the sound so I really can't judge on that, but the game was very enjoyable.I really liked that this game had a lot of hidden objects, so many of other games don't have as much. 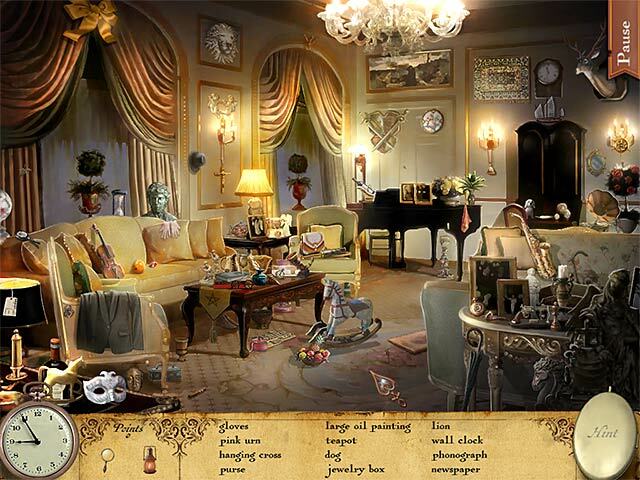 Not everyone likes so many of the other hidden object games out there but would love this one. This will be one I purchase to go with the other 250+ games I own of Hidden object games. I liked that I didn't have to click all over the place to other rooms as well. Give it a try for yourself. Rated 4 out of 5 by codester9 from Ignore the bad reviews! I'm hoping that I can help raise the overall rating on this game, because it deserves more attention: I'm always curious why people who don't like HOGS play HO games and then complain about too many HOGS! I love them, which is why it's my favorite genre. Okay, this game isn't very fancy and doesn't have voice overs or any other bells and whistles that make top notch games, but it's fine. It's nice to find a basic game once in a while that still presents some challenges and enjoyment. Every scene includes a HOG and some also have puzzles. It's atmospheric, with very nice music. Give it a chance before you ignore it. I love the very Russian artwork and unique objects. Thanks BFG. Rated 4 out of 5 by purpleporpoise from Much Much Better on a Bigger Monitor! Beautiful Graphics in HD! I played about 45 minutes through the trial and will definitely be buying Antique Shop: Books of Souls. The HOGs are challenging and I personally don't mind the abundance of HOG scenes in this game, because I love looking for hidden objects. The graphics are beautiful and the background music is pleasant with a sort of medieval Celtic New-Age melody that loops, but is not intrusive or distracting. The mini-games have so far been easy - word seek, matching - but I would expect them to get more difficult as the game progresses. Interesting plot line: Emily finds a Book of Souls in her deceased uncle's antique shop filled with names of people and their birth and death dates. What does it mean? HOG locations correspond to locales meaningful to the people whose names are in the book, which is also your notebook. No voice-overs, all text. But I personally find voice-overs irritating at times and I read faster most times than they can talk anyway. Hints refill quickly and there appears to be no timer or penalties for wrong clicks, which is great! As another reviewer has said, this HOG doesn't have any of the dark, evil, eery themes that a lot of HOGs here have, which is another definite plus with me. Storyline seems to be more of a mystery. However, I will note, as has been said in previous reviews, the objects are small and well-hidden in dark areas. You can lighten it up a bit through the options menu and use the lamp from your items cache to light up areas you want to look in. I did have problems with a slow-moving cursor at first, but I went to the options menu and moved the arrow all the way to the left and the cursor moved and responded normally after that. I really liked this game in spite of the tiny objects and dark background, so I decided to try playing it on two different monitors - a standard 15-inch VGA monitor and a 28-inch HDTV acting as a monitor. On the smaller monitor, I found that I had all the problems previous reviewers have pointed out - dark screen, really tiny objects, magnifying glass that warped objects rather than making them easier to see. However, on my larger HDTV, it looked like a completely different game. The screen was much brighter without having to adjust brightness through the options menu and the objects were larger, of course. The graphics are crisp and absolutely beautiful in HD! I will say, too, that I also have a better video card on the PC hooked up to the HDTV, so that may also make a difference. My final recommendation on this game is that if you have a big monitor that can do high-def, then play the trial and see what you think. It's a definite buy for me during today's 24-hour sale. It says there are 60 levels and I'm a slow player, so I'm expecting many hours of play. One other thing I will note is that the same objects don't always come up in the HOG scenes if you happen to start the game over using a different profile. So there is possibly some replayability here as well. I'll update my review in the forums when I finish the whole game. Happy HOG'ging, Fishies! Rated 3 out of 5 by msmile3 from Possibilities! I too liked this game because it was different. LOTs of HOS. Very challenging things to find in each scene but I liked that a lot. The light and glass were not the greatest. These developers have a future if they streamline and pay attention to the details a little more. Hope they do. Very nice music. Rated 3 out of 5 by SockTrollQueen from I don't hate it. These are my thoughts after 28 minutes of game play on the demo. It feels like it was a rush job. I think if they put in more time and effort this could be a decent game. The story line itself could be interesting with some good VO which it has none of, I seriously don't mind reading but if you are going to make something wordy, choose a font that is easier to read or at least place it on a word box that doesn't make it seem like the words are blending together making it hard to read. I found myself squinting A LOT with the HOS. Tiny objects. It gives you a magnifying glass of which I was unable to get to work at all. Also it gives you a lantern for seeing into dark areas again this was no help because it does not seem to work, either. I found myself clicking the hint button because of my inability to see the items. The art style is still pleasing to the eye until you actually have to look for items. The few mini games I played were simple enough, could have been a bit more challenging. I did like the music. I didn't hate the game but 28 minutes in I got a headache from constant squinting with my glasses on. I will not be purchasing. Truthfully, I'd say skip it and pass on the demo. But try the demo and see for yourself. Rated 3 out of 5 by pennmom36 from Don't Worry The Magnifying Glass Is Provided! This could have been a great game, just because items are microscopic/blurry it does not make them well hidden. 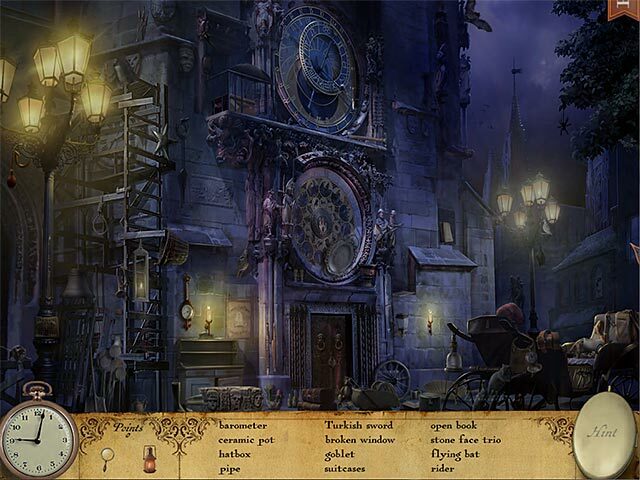 In the first scene you will acquire a lantern and a magnifying glass that can be used in any scene at any time by left clicking on the one you want to use and then right clicking to use that item (and you will use them alot) This is a story about Emily, she inherits her Uncle's Antique Shop and discovers a Book Of Souls. Even though he just died two weeks earlier, his name, date of birth and death were written in the book already. As she starts to feel a connection with the souls of the book you travel to different locations telepathically. Again this is a great concept, although not new, and I really don't mind a game with nothing but HOS, but I really don't want my eyes to bulge over the stress of finding 5 keys and a chisel! There are mini games as well such as word search and flipping tiles over to find a matching pair. If you don't mind looking through the magnifying glass most of the time then you just might enjoy this game.